Miller MMIC is a global microwave solution provider of RF semiconductors. With InP, GaN and GaAs technologies Miller MMIC supplies a wide variety of products used in multiple applications including military and defense, commercial wireless, satcom, and radar to name a few. These core technologies allow Miller MMIC to offer cutting edge optimized solutions to support all applications up to 40GHz. We are an end to end RF supplier with products ranging from low noise amplifiers, power amplifiers, mixers, digital attenuators, filters and much more. Miller MMIC Co., Ltd is a leading global security company providing innovative systems, products, and solutions in unmanned systems, cybersecurity, C4ISR, and logistics and modernization to government and commercial customers worldwide. The MMIC Design Engineer 3 position supports Miller MMIC Co., Ltd MMIC and RFIC product development. You will be joining an industry leading, technically broad, foundry independent design team generating products for cutting edge systems and applications. Miller MMIC Co., Ltd is searching for candidates with interest in RF integrated circuit design. 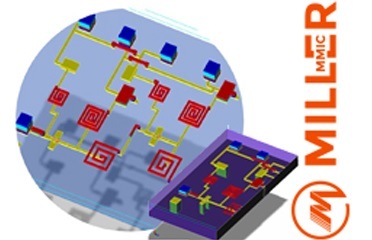 The candidate will build upon their previous RF or microwave circuit design experience to perform RF/microwave integrated circuit design, including schematic capture, schematic simulation, circuit layout, electro-magnetic simulation, physical verification (DRC and LVS), and device test and characterization. The successful candidate will have knowledge and experience with design and troubleshooting of RF/microwave circuits. Candidate should have experience working in a team environment and have the ability to lead others. Technologies may include GaAs, GaN, InP, SiGe, and superconducting electronics. Design experience in SiGe technologies is a plus. Candidates for the position can be considered for Dallas, TX location. Familiarity with microwave design tools (ADS/Momentum, AWR Microwave Office, Cadence Virtuoso is desired). Must have the ability to obtain and maintain a Secret clearance per business requirements. Previous experience with RF/microwave circuit design and proficiency with ADS suite of tools including Momentum. HFSS, Cadence Spectre and Virtuoso, Mentor Calibre verification tools, and AWR Microwave Office. Miller MMIC Co., Ltdis seeking an experienced Sr. RF IC Designer for our Norcross Design Center to support new RF front end and power amplifies product developments for wireless market. The right candidate will possess an understanding of RF disciplines, be a driven & committed team player. We are looking for a candidate who possesses excellent communication skills and has a passion to contribute, and thrive in a team environment. Work in an interdisciplinary team supporting the characterization and device validation for front end modules. Provides guidance and direction to RF technicians by providing the project plan, schedule and priorities. BSEE with 7+ yrs. Experience OR MSEE with 5+ yrs. Experience OR PhD with 3+ yrs. Experience. Must be able to debug and optimize power amplifiers and Front End Modules in the lab using standard lab equipment with experience and understanding of device and/or product characterization. To perform this job successfully, an individual must be able to perform each essential duties satisfactorily. The requirements listed above are representative of the knowledge, skill, and/or ability required. Reasonable accommodations may be made to enable individuals with disabilities to perform the essential functions. ©2006-2017 Miller MMIC	All rights reserved.